Where does your brand belong? Semantic product position tracking enables the classification of any product sentiment relative to its market competitors according to a relevant feature vector. SemLab’s semantic text processing allows us to extract qualitative data about anything described in a natural language text. In the Autosentiment project we automatically process the most influential automotive news sites both on-line and in paper. From these messages we extract all opinions expressed about a set of product features selected by our customers. These include the perceived pricing (is the car overpriced or not), cosmetics (does it look good or bad), driving experience, fuel consumption, and level of comfort and equipment. Using this input for a proprietary spatial multi-dimensional classifier we can create the image displayed on the right. 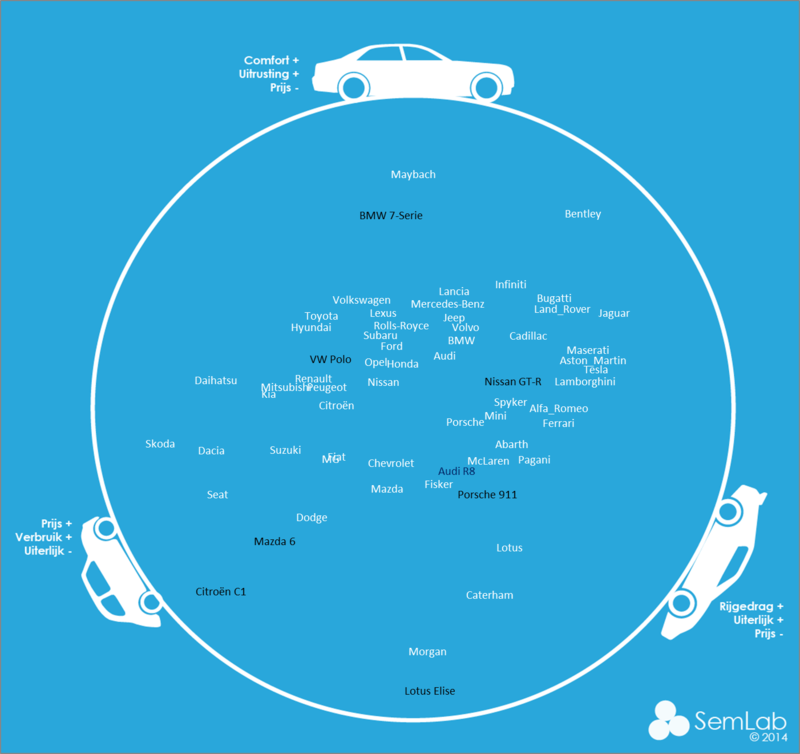 In this image, the main car brands on sale in The Netherlands are shown relative to the three prominent archetypes of the Luxury sedan, the Sports car and the Basic run-around. The image clearly separates the big expensive brands on the top, the supercar manufacturers on the bottom right and the entry level car makers on the bottom left hand site. The graph also includes (in black) some car models for reference purposes. Please note that this information is obtained from the people’s perception of the brands, not the brand managers intended positioning. This means that this type of information can be used to monitor and manage the brand perception over time and place, and monitor the impact of marketing efforts in real-time. If you are interested in this application or its technology please contact us for a full demonstration of our real-time semantic text processing capabilities.